A dog-lover who went into a manure heap to save his beloved pet had a "miraculous" escape, his wife has said. Christine Marshall said her husband Brian Marshall was "within minutes" of death after becoming stuck for nearly an hour in the slurry heap in a field in Bedfordshire. Only his nose, eyes and mouth were visible when the emergency services arrived, she said. He was pulled from the manure heap and treated for hypothermia. 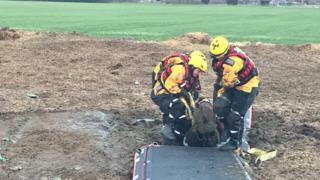 Mrs Marshall said her husband had gone out to walk their dogs, Bella and Archie, from their home in Ickwell on Sunday afternoon, when Bella got stuck in the field, between Ickwell and Caldecote. "We are dog, plus, plus, plus, people, so Brian went in to get her. "He had no idea how deep or big it was; he got Bella out, but he became stuck." She described how 17-year-old Bella was the hero of the day, as she ran to a nearby vets. "She screamed and yelled, as she is a bit of a diva", and her behaviour and the state of her fur raised the alarm, Mrs Marshall said. Simon Maudlin, a neighbouring farmer, who was alerted at about 15:30 GMT, said: "I don't think Brian was going to last much longer. He is very lucky." Mrs Marshall said the rescue was "miraculous" as the fire service used a "new rescue technique" to get her husband out. Bedfordshire Fire and Rescue Service warned pet owners to call 999 for help rather than putting themselves in danger. Mr Marshall was taken to Bedford hospital smelling "horrific", but was home by the evening, Mrs Marshall said.